Lose yourself in Bogotá and discover all the fascinating things there are to uncover. 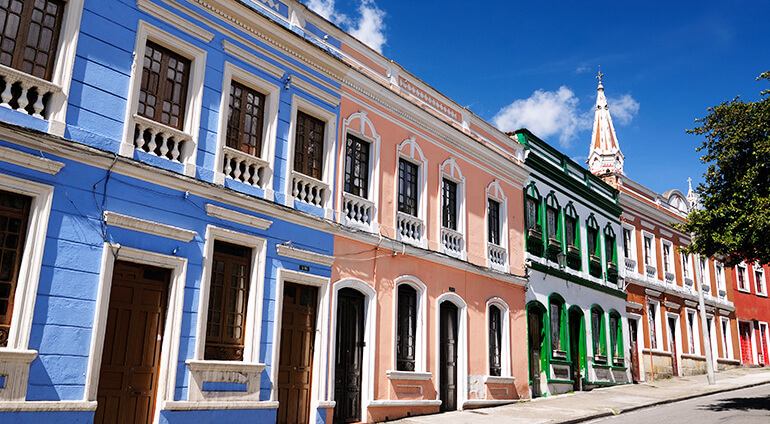 Start by exploring several of the city’s many museums including the Gold Museum which houses pre-Hispanic objects, Museo Botero and the Colombian National Museum. Next, appreciate the impressive colonial architecture throughout the city and visit key sites such as the spectacular Archbishopric Cathedral of Bogotá. Head to The Bolivar Square in the heart of the city, where you can see a statue of Simón Bolívar which was sculpted in 1846, and the Capitolio Nacional building which houses both houses of the Congress of Columbia. After a busy few days in the city, you might want to unwind in one of the lovely green spaces. Bogotá is home to one of the largest urban parks in the world. Some of the best open spaces in Bogotá include Bogotá Botanical Garden and 93 park. Kids will enjoy a day out at Salitre Magico or the Planetarium of Bogotá. For amazing views of the city climb up Monserrate Mountain, which rises to a height of 3,152 metres above sea level. Here you will find a church with a shrine, you can reach the top by hiking, taking the funicular or riding the gondola.